When you reach an electrical resistance of 1 Giga Ohm, The measurements are difficult and the resistance reading is very unstable. After 10 M itself, resistance is affected by the humidity of the room and the dust on the resistor. High resistance measurement, can evaluate the resistance of the paint on a resistor or even a small piece of wood. Build your own Insulation Tester. Insulation is used to prevent shocks like plastics, polymers, bakelite, phenolic products. In power distribution ceramics, oil, glass and fiberglass is used. In telecommunications and electronics we use glass epoxy, teflon, silicones for isolating/separating conducting paths of copper and copper wires.Insulation Resistance Measurement, Polarization Index and High Voltage Breakdown tests measure effectiveness and quality. I had a set of Victoreen Resistors which were in thin sealed glass bulbs, like large reed relays from 1G Ohm to 1T ohm. High Resistance measurement is possible from test voltages of 100V to 1000V. The leakage current can provide data for evaluating resistance. In components like transformers, it will take a long time for a stable reading, so the charge, discharge, leakage of the Coil Capacitance can help measure Insulation Resistance or polarization index. These tables were part of the user manual of my insulation tester, there may be OCR and entry errors i made, the data is from a Scientific Journal (USA) and dated around the 80s. I will add more details as i get them. You saw in the above table that some oils make very good insulators. In Power Energy Transmission, many large power transformers are cooled and insulated with oil. Volatile liquids are not safe for insulation as the fumes will ignite on leakage. See a tool used to measure insulation Megger MIT415 - Electrical Testing Tool. Glass is perhaps one of the best insulators along with ceramic, teflon and the Silicones. These insulators are also excellent performers in high temperature. Glass fibers can be woven into cloth or braid for sleeves and separators. Glass cloth and has chemical and wear reisitnce. Alumina Ceramics are also heat conductors. Contamination near the sea brine and any industrial gas salts along with high humidity will form high conductive layers on PCB or enclosure. Sometimes even less than 1 Mega Ohm. posing a danger to sensitive electronics or sensors. Organic contamination with oil may not pose danger but the leakage currents are enough to cause measurement errors. 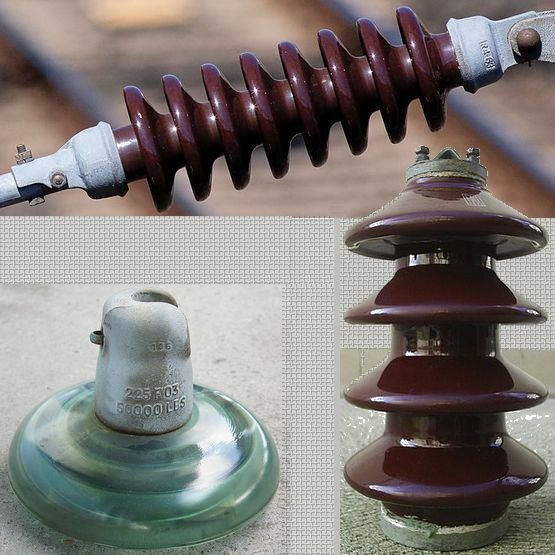 These are nearly ideal insulators, as they are not hygroscopic (do not absorb moisture) they are sturdy in most HV conditions.Then Surface Resistivity is still a problem, creepage in high voltage, sparking on surface pose problems. Silicone Sleeves, Shrink Tubes, Fiberglass Sleeve, Teflon PTFE Wire and PolySulfone.